The CSI is a unique tool for high speed dispersion and emulsification. It produces finer grind in less time with less heat build up, less power consumption and less wear than any other impeller. As with all our blades it can be bored to fit any of the popular dispersers, including; Myers, Cowles, Hockmeyer, Schold, Shar, etc. Diameter 2 3/4" 3 3/4" 5 1/2" 7 1/2" 10" 12" 13 1/4" 17" 20 1/2" 28"
A patented design using the Venturi principle to produce very fine grinds with laminar flow and less heat build-up. Also, excellent for emulsification when operated at low speeds. Has minimum heat build-up and longer life than any other design. Pat. No. 3486741. 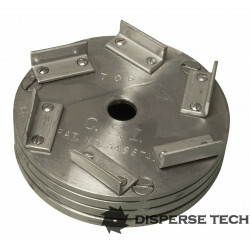 The CSI is more versatile than any other impeller. By adjusting the configuration and distance between the Venturi rings, or by providing different spacing in multi ring units, the CSI can be adapted to meet a wide variety of operating conditions from high to low viscosity.